What do the aliens think about AGW politics? You’ve mastered the science of fission, and you are still building windmills? This is excerpted from a 2014 University of Michigan report from the National Surveys on Energy and Environment. Conventional wisdom holds that a carbon tax is a political non-starter. However, results from the latest version of the National Surveys on Energy and Environment (NSEE) provide evidence of substantial public support for a tax on the carbon content of different fossil fuels when specific uses of tax revenue are attached. A majority of respondents support a revenue-neutral carbon tax, and an even larger majority support a carbon tax with revenues used to fund research and development for renewable energy programs. The carbon tax coupled with renewable energy research earns majority support across all political categories, including a narrow majority of Republicans. These findings generally confirm previous NSEE results when revenue use options are linked to carbon taxation. These are among the latest findings from the Spring 2014 NSEE from the Center for Local, State, and Urban Policy at the University of Michigan and the Muhlenberg College Institute of Public Opinion. Most Americans oppose a carbon tax when the use of tax revenue is left unspecified. Overall support for such a tax is 34% in the latest NSEE survey. Attaching a specific cost to the carbon tax reduces overall support to 29%. A revenue-neutral carbon tax, in which all tax revenue would be returned to the public as a rebate check, receives 56% support. The largest gains in support come from Republicans. A carbon tax with revenues used to fund research and development for renewable energy programs receives 60% support, the highest among tax options that we presented. Majorities of Democrats, Republicans, and Independents each express support for this tax. Most respondents oppose a carbon tax with revenues used to reduce the federal budget deficit. Overall support for such a tax is 38% with a majority of Democrats, Republicans, and Independents each expressing opposition to this tax. When asked which use of revenue they prefer if a carbon tax were enacted, pluralities of Democrats, Republicans, and Independents each prefer renewable energy over tax rebate checks or deficit reduction. My read of this and similar polling is that the US could pass a revenue-neutral carbon tax if it is well-crafted. What will get the conservatives into the boat is to ring-fence the revenues so the money doesn’t get gobbled up in the general fund. Just for discussion, say 80% of the revenue is earmarked for rebate like Dr. James Hansen’s Fee and Dividend. The balance of 20% funds a public-private partnership for innovation in technology-neutral clean-energy and climate adaptation. I would like to include geo-engineering research in the mission, but I suspect that’s too emotionally explosive. Designing a mechanism for allocation of the R&D fund is also a real challenge. To recommend the budgeting and allocation design – how about a reprise of the President’s Blue Ribbon Commission? I even have a candidate dream team for you, with Dr. Jane C. S. Long to chair. Jane led the California Council on Science and Technology team who produced California’s Energy Future — The View to 2050. Even better would be to make a partnership of Dr. Long’s CCST team and the Energy Research Partnership team. A US unilateral carbon tax is a big step forward, but alone it won’t get the job done. We need buy-in by enough of the developing nations to attenuate the principal source of future emissions growth. I am convinced that there is a solution to that challenge: that it is to structure this carbon tax as the US component of a Common-Commitment as proposed by the team of David J. C. MacKay, Peter Crampon, Axel Ockenfels & Steven Stoft How to negotiate a climate agreement that will actually work. I don’t know what the numbers would be, but the carbon tax revenue splits would have to be adjusted to support the US share of Green Fund payments. What would be the politics of American support for a Common Commitment deal? 1) Stable regulations are essential for nuclear power to thrive. More than, say, solar or wind, nuclear will always need strict safety and environmental regulations. No way around that. The risks are inherently higher. That’s an example of the “see I’m not pro-nuclear” positioning that we often notice even in informed commentary on how nuclear power fits into the menu of low carbon options. The relative risks of nuclear power are not inherently higher! In his marvelous “Sustainable energy without the hot air” David Mackay’s Chapter 24 Nuclear? examines nuclear power. From that chapter I extracted following graphic. This is David’s computation of deaths per GWy (gigawatt-year), which he has extracted from two of the studies we’ve previously referenced: the EU ExternE research, and the Paul Scherrer Institute. Our goal is to substitute low-carbon for fossil, especially coal, and especially in the developing fast-growing nations. Amongst the low-carbon options, nuclear has proven to be the safest and really the only scaleable option that can displace coal and natural gas. Nobody is proposing to build more unsafe Chernobyl RBMK unsafe. Yet Chernobyl deaths dominate the tiny comparative death-print statistics of our generation options. Take away Chernobyl and commercial nuclear’s death-print is effectively zero. When I first studied the relative risks of our energy options I quickly realized that my fears of nuclear catastrophe were based entirely on media mythology. The media don’t report on the thousands of people killed by fossil fuels every year. Even major accidents like the San Bruno gas pipeline explosion are not widely reported or investigated (this 2010 accident was in a suburb of San Francisco: 8 fatalities, 52 injured). Fossil energy causes real people to die every year – real deaths versus theoretical nuclear deaths. We have a civilizational choice to make: whether we organize political support to scale up construction of advanced nuclear plants that are both economical and orders of magnitude safer than the existing safe 3G plants. If we fail to do that we are going to squander our wealth on the renewables dream – only to find ourselves blockaded by the economics when we are only halfway to our goal of zero emissions energy. If you ask a random citizen of the state “Is California decarbonizing faster than the rest of the U.S.?” they are likely to reply “Of course, California is the leader!” This accepted wisdom was reflected in the recent Mother Jones article by Gabriel Kahn [@gabekahn] Did California Figure Out How to Fix Global Warming?. All of these advances have undercut a fundamental tenet of economics: that more growth equals more emissions. Between 2003 and 2013 (the most recent data), the Golden State decreased its greenhouse gas emissions by 5.5 percent while increasing its gross domestic product by 17 percent—and it did so under the thumb of the nation’s most stringent energy regulations. As the chart above shows, California is decarbonizing, but how exceptional is California’s performance since 2000? In reality, California’s results are not exceptions, but representative of the nation. For the same 2000 to 2013 period discussed in the Mother Jones article, here is a graphic showing California and U.S. greenhouse gas emissions decreases as a function of GDP [thanks to John Fleck for graphing the IEA, BEA and Census Bureau data]. And here’s John Fleck’s graphic showing how California’s per capita emissions compare to the US as a whole. From the time series graphs it’s hard to judge whether California’s results are better or worse than the US average. Mike Shellenberger [@shellenbergerMD] aggregated the EIA 2000-2013 decarbonization data to demonstrate that the nation reduced emissions more than California. This doesn’t account for emissions that California exported to other states (e.g., for power generation) or other nations (e.g., China for the embedded energy in imported goods). Mike has also been analyzing the favorable tail wind provided by crashing natural gas prices. Low gas prices have hidden from the consumer the true cost of subsidizing (non-large hydro) renewables. The US has been enjoying historically low natural gas prices. The lows are an anomaly caused by the local oversupply of U.S. shale gas. The oversupply situation is local to the US because it’s difficult to export natural gas. There are long lead times and large capital investments required to expand gas export infrastructure. Once the excess supply can be freely exported the US natural gas market will clear much like crude oil. Then US consumers will be paying a lot more for natural gas. Changes in generation shares at the regional level, however, strongly support the conclusion that fuel-switching from coal to gas, along with falling electricity demand in the wake of the Great Recession, account for the vast majority of the decline in emissions. Moreover, the shift from coal to gas accounts for a significant majority of the decline in the carbon intensity of the US electrical grid since 2007. In one fell swoop, the unnecessary closing of San Onofre Nuclear Generating Station in San Diego wiped out the low-carbon energy equivalent of almost all the wind and solar installed in California, reversing the state’s 20-year progress in low-carbon energy. Wind and solar are the only low-carbon energy sources growing in California. Geothermal, biomass and hydro have been flat for 10 years. A state-funded study by the California Council on Science and Technology found that only significant nuclear, or obtaining as-yet-undeveloped carbon capture technologies, can solve California’s energy demands and emission goals in this century (CCST Summary; CCST Report to 2050). We geologists know how unlikely carbon capture and storage is, and we should keep trying, but we can’t bet the house on unknown technologies. The California’s Energy Future report that Jim references is a very good piece of work. See my report on the 2013 Travers Conference at UC Berkeley for updates on the study. You can help by supporting Save Diablo Canyon. So how is California doing relative to our two degrees target? Poorly – and most people don’t appreciate how incredibly challenging it is. 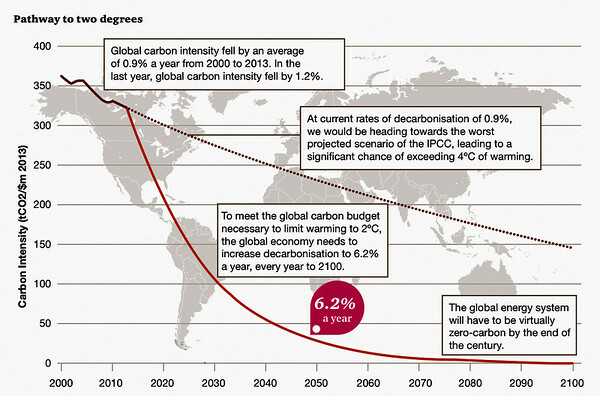 Two years ago Price Waterhouse Coopers estimated that a global compounded decarbonization rate of 6.2% per year would just get us to zero-carbon by 2100. California’s 7.5% over thirteen years is way short of 6.2% compounded — it is not much better than the dotted line in the this PWC chart, and not nearly good enough. When was the last time we saw nations decarbonize rapidly? It can be done. Those of us lucky enough to live in the rich world have grown up with abundant, cheap energy. It is very hard for us to see clearly how much our civilization depends on cheap energy. Our parents might have grown some of our food – but it’s unlikely that our mothers spent five hours a day carrying water and chopping firewood or gathering dung. Our energy surplus allows some of us spend time opining about how India should not build coal power stations but should “leap-frog” to renewable energy sources like wind and solar. The cheap energy that we don’t notice privileges us to worry about preventing Indian fossil fuel development. The preceding guest post by Michael Shellenberger and Rachel Pritzker is remarkable for telling a complex story in so few words: why India’s climb to an urban, energy-rich life is going to happen rather like we did it. And that we can make a big difference for India’s poor by sharing our know-how to accelerate India’s deployment of shale gas and nuclear fission technologies. Solar and wind are self-promoting technologies – let’s put our focus on the less popular but more effective solutions. At the United Nations climate talks in Paris last fall, US President Barack Obama and Indian Prime Minister Narendra Modi emphasised the need to find climate solutions that advance, rather than undermine, India’s development prospects. But the reality of what both nations are doing on climate change does not live up to the rhetoric. The overwhelming focus of US-Indian government climate efforts is on expanding renewables and increasing energy efficiency. Both have merit, but should be third order, not top, priorities. The main climate and development focus of all governments should be on accelerating the pace of energy transitions, from wood and dung to fossil fuels and from fossil fuels to nuclear power. To understand why this is, it is important to put energy and environmental progress in their developmental context. Almost all nations develop following the same pattern. Small farmers become more productive and move from the country to the city to work in factories and offices. Women become newly empowered. Children gain formal education. And couples choose to have fewer children. As fewer farmers must produce more food for more people, they invest in tractors, fertilizer and other ways to increase productivity. Over time, all of this urbanisation and industrialisation delivers large environmental benefits. Using liquid petroleum gas, instead of wood for cooking, almost completely eliminates toxic smoke and can save hours a day. As we move from wood fuel to fossil fuel, our forests can return and become habitat for wildlife. Recently, India was able to protect her Himalayan forests by subsidising the substitution of liquid petroleum gas (LPG) for wood fuel. Factories and cities create more air pollution at first, but over time become cleaner and greener. Rising societal wealth allows for pollution controls such as catalytic converters and smokestack scrubbers. And dust is reduced by paving roads, improving mining and land use practices and tree-planting. In the US and Europe, conventional pollutants have been in decline since the early 1970s, and carbon emissions for the last 10 years. Rich nations can afford to move from coal to much cleaner natural gas, which generates a tiny fraction of the pollutants of coal, and half the carbon emissions. In the US and Europe, major oil and gas discoveries were key to shifting from coal to natural gas and reducing pollution. North Sea natural gas in deep waters reduced Europe’s reliance on coal starting in the 1980s. In the U.S., it was natural gas from shale, a rock formation one mile underground, starting around 2007. China and India both have significant reserves of natural gas and oil in shale, but lack the workforce, drilling rigs and pipeline infrastructure. Those things will develop over time, the question is at what pace. Because solar and wind cannot generate power 24 hours a day, 365 days a year, their value to developing nations that need cheap reliable power for their factories and cities is highly limited. Solar and wind are limited for similar reasons in rich nations as well. As solar and wind become a larger amount of the electrical grid, their value declines, as Germany is discovering. That’s because solar and wind create power when it’s not needed and don’t create power when it is most needed from 5 pm to 9 pm. The great emphasis put on an energy source that cannot support industrialisation and urbanisation is not a coincidence. 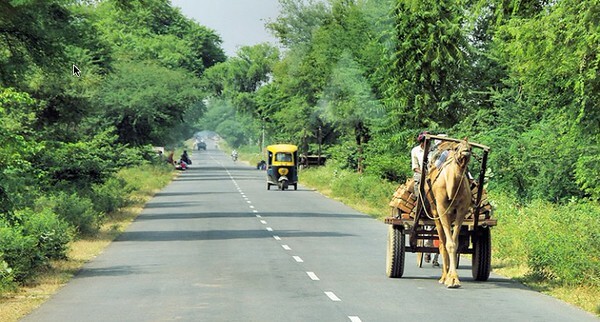 Environmentalists in India and the West have since the 1960s promoted the Romantic idea that low-energy consumption, rural subsistence living, and renewable energy are best for people and the environment. The last 50 years shows how wrong this idea is. Economic growth remains tightly coupled with energy consumption. A recent analysis of 76 countries found that Indians and Chinese earning $50,000 per year consumes the same amount of energy as Americans and Europeans did when earning that same amount. Where European, US and Indian governments put great emphasis on off-grid solar in rural villages, historically most people gain access to LPG and electricity by moving to cities. Solar and wind are promoted as energy sources with little negative environmental impact but both have large impacts measured on per unit energy basis. Both require 100 times more land as fossil and nuclear plants. And wind and solar require five times more concrete and steel, respectively, than coal, nuclear and natural gas plants, according to the US Department of Energy. Given the limits to solar and wind in both rich and poor countries, significantly reducing greenhouse gas emissions will require a faster transition to nuclear energy, first fission and then fusion. Where the transition from wood to coal began 500 years ago, the transition from fossil to nuclear energy began just 50 years ago. India is a special case in that while most countries complete, or almost complete, the transition from biomass (wood and dung) to fossil fuels, India aims to make both energy transitions happen at the same time. Rich countries have the strongest scientific and technical workforces capable of building and operating nuclear power plants, but ideological opponents of the technology have successfully spread fear of nuclear energy since the 1960s. Polls show Indians support nuclear energy but the Indian nuclear energy programme is only now recovering after having been isolated from the global community over recusal from the Non-Proliferation Treaty. As such, the most important work by Modi and Obama on climate was removing hurdles to greater US-India collaboration on nuclear energy. India could soon start constructing power plants with US and European companies and hopefully one day soon the Japanese, Chinese and Koreans. The same should be done on natural gas. The US can help India to better access its natural gas reserves, and the Indian government can take advantage of low cost natural gas due to the global oversupply, and potentially start importing large quantities of natural gas from Iran. Nations around the world, including the US and Europe, show that the transition from wood to fossil fuels takes decades. To the extent there is energy leap-frogging it will mostly be from wood to natural gas and nuclear, not to solar and wind. Renewables should play a role but should not distract nations from the main event of accelerating energy transitions for environmental progresss. Michael Shellenberger is President of Environmental Progress, an independent research and policy NGO based in California. Rachel Pritzker is President of Pritizker Innovation Fund, a philanthropic foundation supporting technological innovation for human development and environmental progress. Over the next century we need to triple the global quantity of energy production. Everything that makes civilization civil requires electricity, liquid fuels and energy for industry. Plus we need to help boost another three billion people out of poverty. That means most of the expansion of new energy production is needed in the Global South – outside the OECD nations. Safe, carbon-free nuclear fission should be a big part of that solution. Let’s take Kenya as an example of the nations that want to build new nuclear power plants. To make that commitment they need affordable access to nuclear fuel. They need to be confident that fuel will always be available to them, regardless of future political issues. It also makes their nuclear launch much easier if they need only to contract for fuel delivery and reprocessing/disposal. If they have to also develop their own nuclear fuel cycle that probably makes the nuclear option uneconomic. If Kenya can’t access the nuclear option we know they will continue with the fossil option. External pressures: the OECD nations may try to block Kenya’s access to nuclear power, especially if they are concerned about increasing weapons proliferation risk. Certainly anti-nuclear NGOs like Greenpeace will raise the bogeyman of proliferation to disrupt new nuclear power. I think it is completely obvious that a politically reliable nation like Australia is a perfect match with Kenya’s need for a dependable front-to-back nuclear fuel partner. Australia can be the “Amazon Prime” for nuclear fuel for all the new nuclear nations, and the existing cases like India and Pakistan. I’m anticipating a favorable report from the South Australian Nuclear Fuel Cycle Royal Commission. So is principal contributor Ben Heard who wrote yesterday explaining the benefits of the “establishment of a multinational storage facility for used nuclear fuel and the subsequent recycling of that material for clean power”. Whatever happens tomorrow, some stakeholders will stop at almost nothing to try and frighten South Australians. As well as the potential to benefit economically, we may have the opportunity to shift the world to a decisively safer state of relations. There has never been a more important time to listen to the experts. In more ways than one, our future depends on it. Deep de-carbonization of the electricity grid via renewable energy and without nuclear power can be done, but we should not underestimate the cost or speed of doing so in many parts of the world. At the minimum, the costs involved suggest that efforts to solve the nuclear cost-safety puzzle could yield large dividends in a post-carbon world. Such is the belief of the scientists, academics and environmentalists who still see a substantial role for nuclear power in the future (see Appendix V). See you next year. The report gives enough detail that you can see why Germany’s nuclear ban leads to a shocking cost of avoidance of $300. I’ve circled in green the baseline Energiewende result estimated to cost $300/mt CO2. J.P. Morgan modeled a balanced deep decarbonization strategy, which using 35% nuclear, costs only $84/mt CO2.Note that the $300 is a bare-bones estimate – none of the cost of the additional transmission infrastructure required by high-renewables is included in the analysis. Even so the baseline Energiewende plan will double already second-highest in Europe current costs from $108 to $203/MWhr. What about Caliwende? The cost to consumers is lower than for Energiewende but the CO2 avoidance cost of the baseline plan is $477/mt CO2 — even worse than Germany because California has already done more CO2 avoidance. Happily, if California implemented a balanced plan (35% nuclear) that drops the CO2 avoidance cost to $174/mt CO2. That is still unnecessarily expensive because of the high-renewables ideology. Well, at least both plans have closed a lot of those nasty fossil plants, right? Actually not. Because of the intermittency, at least all of the current thermal generation is required to cover the demand gaps. These charts show just how big those gaps are. This is the largest single source of the high CO2 avoidance costs. All that mostly-idle thermal capacity is still required by the ideology of high-renewables. That means a very small capacity factor so the capital has to be amortized over too-few generation hours. Intermittency greatly reduces the importance of wind and solar levelized cost when assessing high- renewable grids. The cost of backup thermal capacity and storage is an inextricable part of any analysis of a high renewable system. Academic and industry research has reached similar conclusions. A 2015 paper from the Potsdam Institute for Climate Impact Research notes that integration costs in systems with high levels of renewable energy can be up to 50% of generation costs, and that the largest single factor is the additional cost of backup thermal power. Even in California, there are uncertainties to this Brave New World: California’s Independent System Operator gave a presentation in 2014 highlighting how the impacts from increasing renewable energy on the grid are still not fully understood. They mentioned voltage fluctuation due to upward/ downward ramps, high voltage issues on distribution circuits, voltage/power regulation control issues, the greater number of operations and increased maintenance on voltage control, etc. We often hear people referring to other what-ifs regarding high-renewable grids. Many rely on highly uncertain assumptions and conjecture, while others neglect related costs. Could cross-border integration of high-renewable grids reduce the need for backup power and its corresponding cost? That’s the next wave of renewable energy research. It would cost money to build these interconnections, but in theory, if wind and solar patterns are more divergent the larger the geographic area covered, the problem of renewable intermittency could simply be diversified away. Unfortunately, new research on wind suggests that this theory has major limitations. This remains a premise best proven empirically rather than by assumption. What about over-building renewable energy and storage so that the need for and cost of backup power is eliminated? The good news: it’s an emission-less system. The problem is that incremental solar, wind and energy storage costs would dwarf foregone costs of backup thermal power. Our models determined that a system in California with enough wind, solar and storage to eliminate backup power entirely would cost $280-$600 per MWh, which is 2.5x – 5.0x more expensive than Caliwende (depending on assumed storage system properties and costs). Bottom line: a renewable energy storage version of the Temple Granaries looks to be prohibitively expensive. Why not draw on electricity stored in electric car batteries (“car-to-grid”) to reduce storage costs? Another theoretical possibility that’s only worth discussing when we can determine the penetration rate of plug-in vehicles, the participation rate of drivers willing to share their battery with the grid and how much of it they would share, the cost of interconnections, and the cost of incentives required by drivers to have their expensive car batteries cycled more frequently. See Appendix VII. What about “demand management”? If demand could (somehow) be reconfigured to match up with variable renewable generation, unused surpluses and demand gaps would be smaller and system costs could decline. 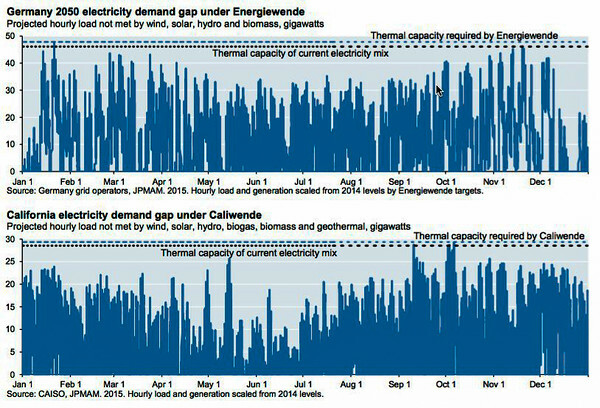 However, demand management is meant to deal with intraday supply-demand issues, not intermittency issues which span weeks and months. See Appendix VIII.